MSRP: 2,592 JPY (U.S. $23.35) at Platz. 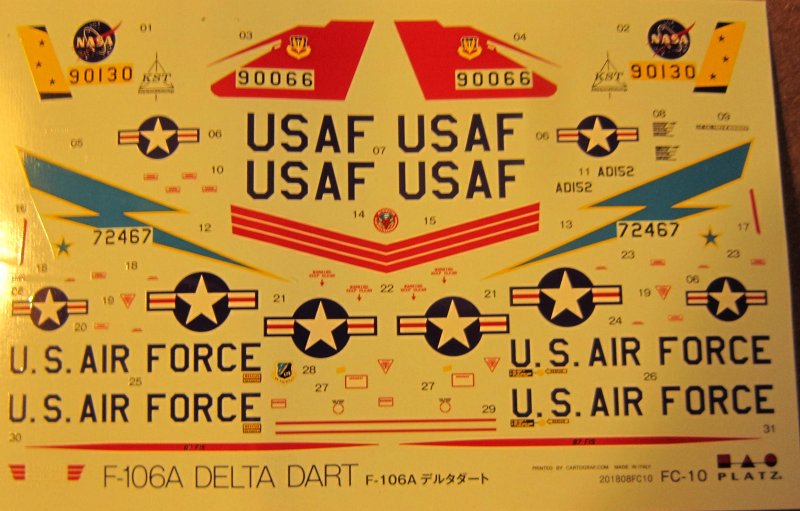 The Convair F-106 Delta Dart was the primary all-weather interceptor aircraft of the United States Air Force from the 1960's through the 1980's. Designed as the so-called "Ultimate Interceptor", it proved to be the last dedicated interceptor in U.S. Air Force service to date. It was gradually retired during the 1980's, with the QF-106 drone conversions of the aircraft being used until 1998 under the Pacer Six Program. Platz is a prolific model company based in Shizuoka City, Japan. They make all manner of model subjects in the popular scales. This kit comes in an end-opening type box that is not shrink-wrapped. 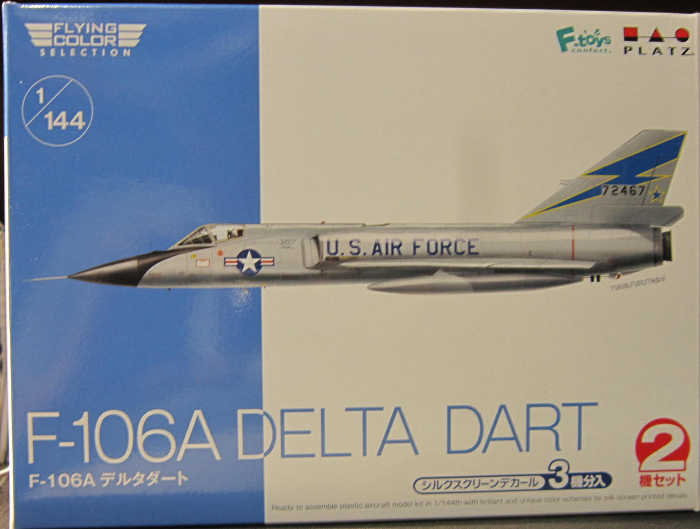 The box art shows a F-106 Delta Dart posed against an half blue and half white background. It is overal grey, with a black nose, star and bar insignia under the cockpit, U.S. AIR FORCE on sides of the fuselage, black lightning flash outlined in yellow on the rudder, with black serial no. 72467 and a black star outlined in yellow on the rudder flap. 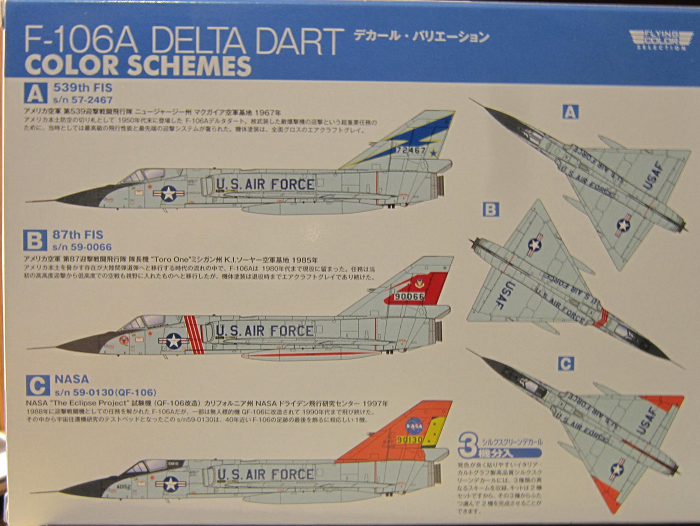 The box art says the kit holds 2 ready to assemble plastic model kits in 1/144th scale (length 3", wingspan 2 1/2") with brilliant and unique color schemes by silk-screen printed decals. 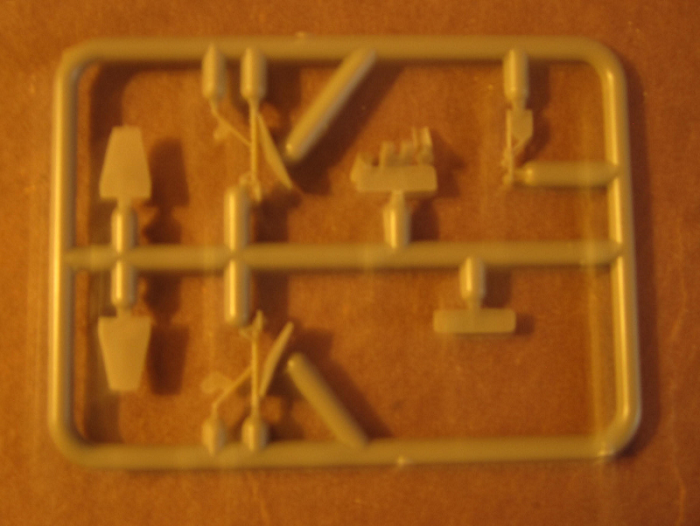 One side panel of the box says: these are plastic unassembled scale model kits. Glue and paint are not included. Some parts are extremely sharp, handle carefully. Suitable for modelers age 15 and above, in Japanese, English and French. 1. A F-106A in overall grey with black nose, star with bars before 3 vertical red stripes behind the cockpit, followed by U.S. AIR FORCE. There is a black shield on rudder over serial no. 90066. Aircraft is as it was seen in 1985. 2. A F106A with NASA. It too is overall grey with a black nose. It has a star with bars under the cockpit, U.S. AIR FORCE on fuselage sides, red rubber with a yellow flap. A black circle with white NASA on it over a black serial no. 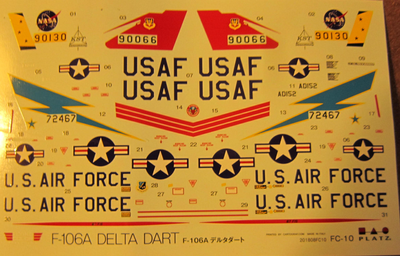 90130, the yellow rudder flap has 3 red stars on it. It has red wing tips. It is an aircraft with NASA, serial no. 59-0130 (QF-106) as the aircraft was seen in 1997. ​The bottom of the box repeats all the above schemes and above views. Captions are in Japanese and English. There are 5 light-grey trees. 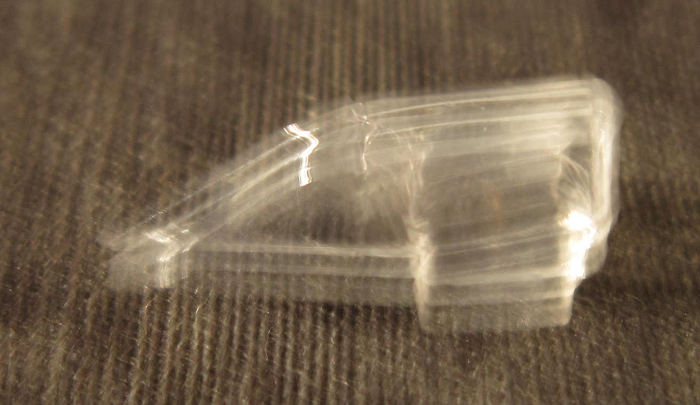 clear transparency part and a decal sheet in 2 clear self-sealing cello bags and the instructions. 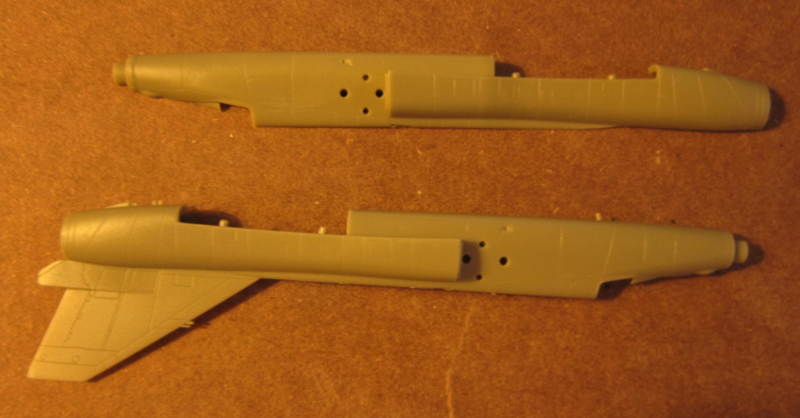 The model makes up to have a 5 1/2" long fuselage and a 3 1/2" wingspan. The instructions consists of a single-sheet that is folded in the center to create 4 pages in 8 1/2" x 6 1/2" page format, printed on slick paper. Page 1 and 2 begin with a repeat of WARNINGS about the kit. 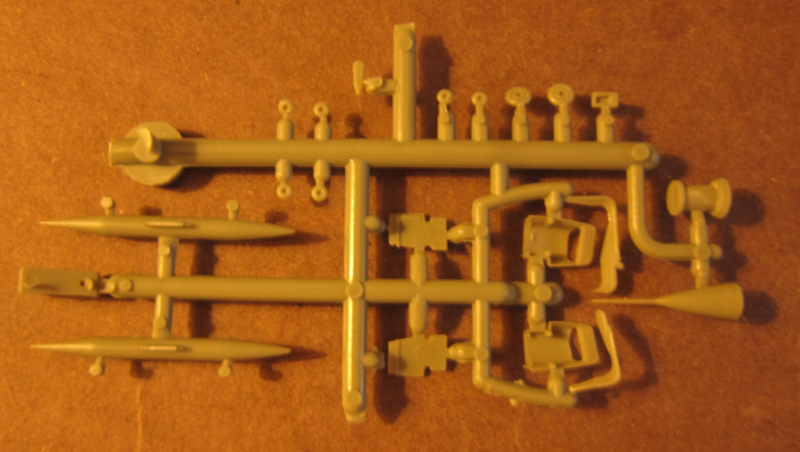 Kit is intended for modelers 15 years and older, in Japanese and English over 5 assembly steps, decal application instructions and Platz's telephone and FAX numbers, web address and street address in Shizuoka City, Japan. Page 3 and 4 is the painting and decal application instructions. There are three 4-views showing each of the 3 schemes already described above. Page 4 has a suggested paint color listing of Mr. Color and Model Master brands of paints, over assembly step no. 5 that is for the small parts. Part trees are not alphabetized or have part number tabs next to the parts on the trees. However, the trees are illustrated and parts numbered in the instructions. ​The second and third medium-grey trees each hold a fuselage half. 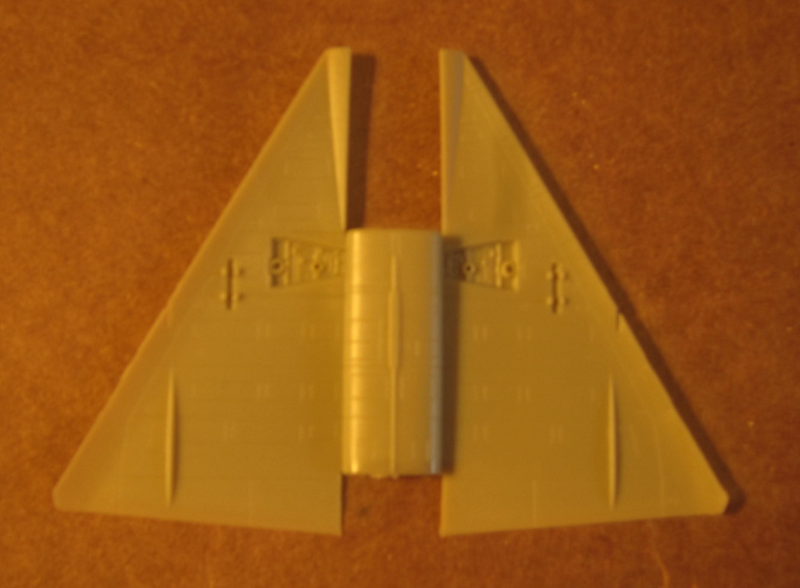 ​The single clear canopy part and the decal sheet complete the kit's contents. ​The decal sheet included a tissue to protect it's face from scratching. Great engraved detail. Highly recommended. I want to thank the folks at Platz for this review sample.